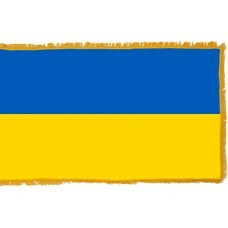 The Ukraine flag features two equal horizontal bands in the colors of blue and yellow. The yellow color represents the fields of wheat and the blue color represents the sky, mountains, and streams of Ukraine. The blue and yellow colors became the national colors of Ukraine in 1848 and were derived from the Coat of Arms of Lviv. 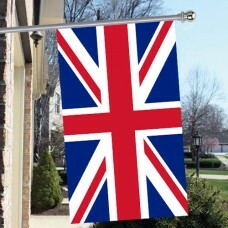 The first national flag that was adopted in 1848 featured two horizontal bands with the yellow as the top color and blue at the bottom. 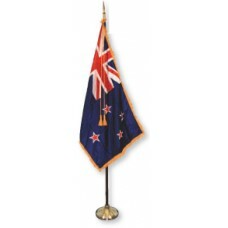 The colors of the flag were reversed in 1918 to represent "blue skies over golden wheat fields." 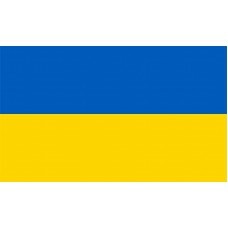 The current Ukraine Flag was adopted on January 28th, 1992 following decades of the original flag being banned when the country was occupied by the Germans and the Soviets. During the Soviet Rule, the red banner of the Soviet Union was used as the national flag under the communist system. Following Ukraine’s independence and the collapse of the Soviet Union on August 24th, 1991 the anti-communists fought for the flag to be replaced with the current Ukraine flag. Ukraine is a country in Eastern Europe (the second largest country, following Russia) and shares borders with Russia, Belarus, Poland, Slovakia, Hungary, Romania, and Moldova. The capital and largest city is called Kiev. Kiev is referred as the "spiritual capital" as pilgrims travel here to visit the "Sofia Kyivska Church" as well as "St. Michael’s Golden-Domed Monastery." Ukraine (which translates as "borderland" or "region") was formerly known as "Kievan Rus" until the 16th century. Ukraine is a country that has endured many invasions and attacks, mainly due to the fact that it is a country full of natural and wealthy resources which are, iron ore, oil, salt, Sulphur, granite, coal, and gas as well as others. It has come under the power of many different countries which include, Lithuania, Poland, Austria-Hungary, the Ottoman Empire, and Russia. The most prominent and significant period in Ukraine history was while it was under the rule of the Soviet Union and was part of the tragic man-made famine. The "Holodomor" (which translates as “death by hunger”) and is also known as the Terror-Famine or Famine-Genocide, occurred between 1932-1933, under the rule of dictator Joseph Stalin and killed approximately 4-5 million Ukrainians. During Stalin’s rule, he ordered "Collectivization" (social and economic control) of the entire countryside to reduce the power that the peasants had of their land and to reduce the chance of Ukraine trying to gain independence. He ordered farmers to work on the government land for very little money and to sacrifice their own land which the farmers/peasants revolted against. Due to this, Stalin took food away from the people and made it illegal for food to be picked from the fields and exported the majority of the grain that the country produced, resulting in millions of people dying from starvation. The economy in Ukraine today is reliant on its agriculture products and machinery that are exported to approximately 210 countries.